Hyksos is the name given by the Egyptian historian Manetho ( III e s. BC.) Asian invaders who dominated Egypt about 1730 to 1560 BC Josephus, a historian of the I st century AD, has preserved the passages where Manetho mentions the invasion of the Hyksos. “The Hyksos were a people of diverse origins, possibly from Western Asia, , who settled in the eastern Nile Delta some time before 1650 BC. The arrival of the Hyksos led to the end of the Thirteenth Dynasty and initiated the Second Intermediate Period of Egypt”. All these Hyksos people were called “kings-shepherds.” For hyk in the sacred language means “king” and sôs in the vulgar language means “pastor”. The meeting of these two words gives Hyksos. This etymology is only partially correct. If hyk comes from heka “chief, prince,” not transcribed Shasu “nomads” is an abbreviation of the word phaseout “foreigners” and the expression hekakhasout gave Hyksos appeared in Egypt in 2000 BC It applies to leaders of nomadic tribes roamed the Syrian-Palestinian desert. The Hyksos invasion certainly did not have the brutal character attributed to it by Manetho. We must speak rather of progressive infiltration than invasion. In the same way, the invaders probably did not belong to a single race. In majority Semites, they must also include other inhabitants of Western Asia, themselves driven from their territories by the Indo-European invasions of the second millennium BC The Egyptians referred to them under the names of “Amu”, or “Setetiou”, or “Mentiou de Setet”, or even “Men of the Retenou”, that is to say under all the names given to Asians close to Egypt. Around 1551 BC In the 3rd century BC, the conqueror of the Hyksos, Ahmose, was crowned Pharaoh. With him began the rule of the 18th dynasty. Under him began the reconstruction of the country. It was followed by his son Amenhotep I (1526 BC) It followed in 1505 BC. 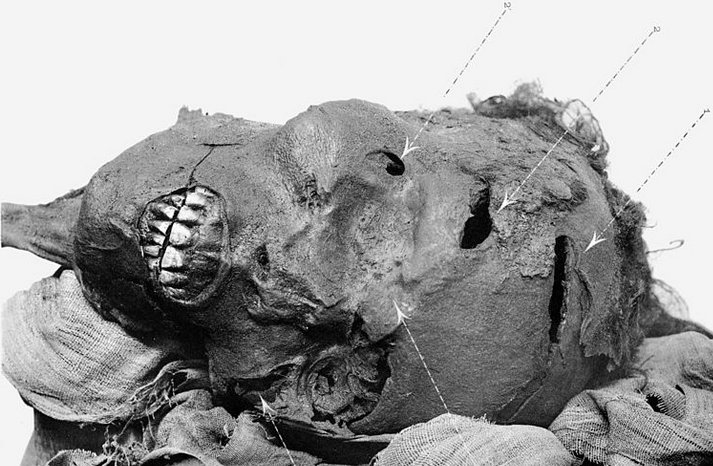 Thutmosis I. He was married to Ahmose, his half-sister. The new pharaoh was a great strategist who extended the empire far south to the 3rd cataract of the Nile. This was followed by further conquests in Syria to the Euphrates. The ruler was not just military. In his reign of about 13 years, he organized the reconstruction of the country and was responsible for numerous buildings. In the temple building, he set standards for the next epochs. He had large gates with mighty pylons built, for the first time obelisks were built. The obelisks were dedicated to the worship of the sun because at this time the cults around Amun and Re emerged. The pharaoh also built the first rock tomb in the Valley of the Kings. The weapons of the Hyksos have survived mainly in the form of grave goods. The typical war machines include battle axes, javelins, spout lances, and daggers. Asian Bedouins carried Entenschnabeläxte the will and Tüllenlanzen already in grave Khnumhotep II. In Beni Hassan displayed. In Stratum F, the earliest find of a sickle sword in Egypt could be made, which was used as a weapon in the early 1800 BC. In the 13th dynasty, the Hyksos already used an improved metal technology, which was achieved by imported bivalve soapstone models. Previously, only single-shell limestone or ceramic models were used. 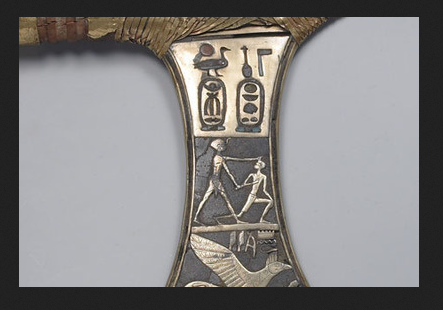 The new technology was adopted in the New Kingdom and led to advanced Egyptian metalworking. 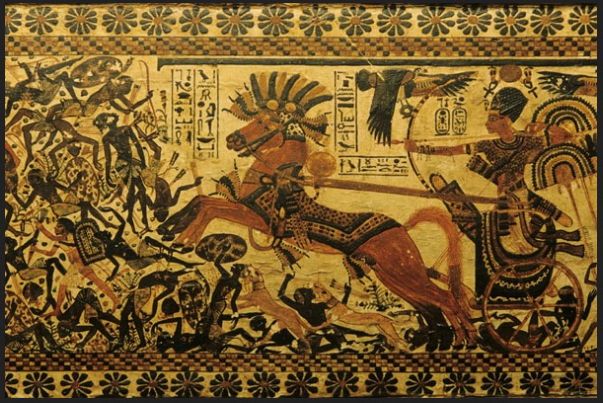 The introduction of horses and chariots attributed to Hyksos in Egypt could be confirmed by grave finds, such as horse skeletons were discovered in Auaris. 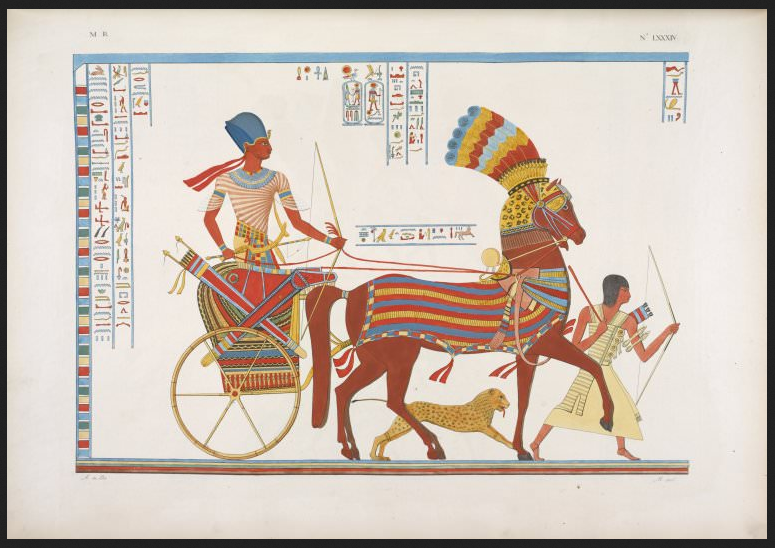 Chariots and horses are attested in the 17th Dynasty but also textually. Depictions on reliefs in the Ahmose Temple of Abydos, discovered by Stephen Harvey in 1993, are already being used by the Ahmos ids to fight the Hyksos.